Film review of the Belgian drama directed by Jeanne-Pierre and Luc Dardenne and starring Marion Cotillard. Directors: Jeanne-Pierre Dardenne, Luc Dardenne. Les Films des Fleuve/Archipel 35 et al. Producers: Jeanne-Pierre Dardenne, Luc Dardenne, Denis Freyd. Writers: Jeanne-Pierre Dardenne, Luc Dardenne. 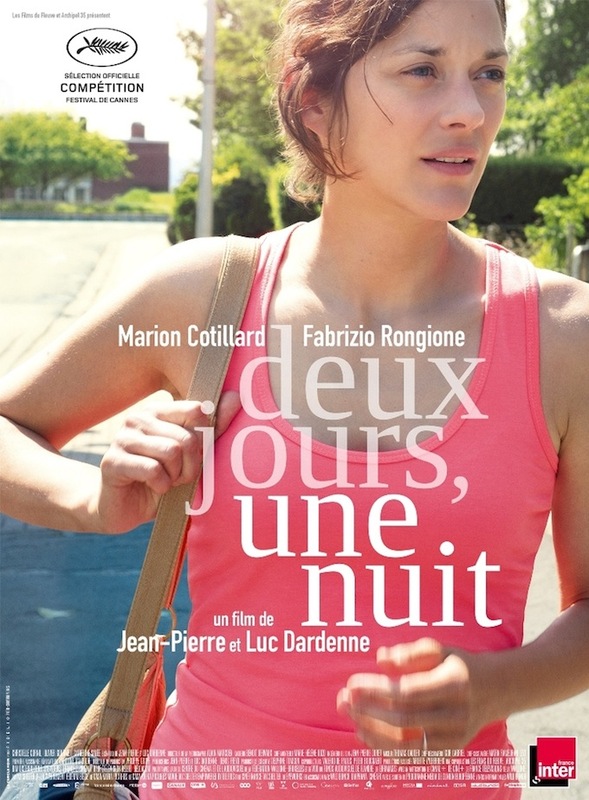 Marion Cotillard, Fabrizio Rongione, Catherine Salee, Batiste Sornin. A woman (Cotillard) who is recovering from severe depression is sacked from her job at a factory following a ballot among her colleagues, who would prefer to receive a bonus instead of retaining her. Given that the vote may have been swayed by the foreman who doesn’t like her, her boss gives her the weekend to put her case to stay to her employees who voted against her, leading to an emotionally grueling two days and one night. Cotillard is used to turning in powerful performances as women on the verge of an emotional breakdown, from the fragile torch singer Edith Piaf in La Vie en Rose (2007) and in Rust and Bone (2012) as a woman who loses her legs after an accident when she is training Killer Whales. Hardly your run of the mill slice of life dramas like the role she has here in this Dardenne drama, but Sandra is a gift for her and it is an opportunity she shines in. Less showy than her other roles but still intense, Sandra is a bag of neuroses, panic attacks and Xanax addiction. The conversations she has with her colleagues are charged with a terrific desperation; she has enough pride to be afraid of appearing to be a beggar, but with Cotillard’s innate delicacy and intelligence, Sandra quietly entreats people to support her and not themselves. Bare-faced with no hint of glamour, all the right boxes are ticked for an Oscar worthy performance, though she lost this year to Julianne Moore in Still Alice. The story is an excellent, micro criticism of the capitalism and scores several hits as the little man (or woman in this case) is pitted against the wheels of the big machine. But more tellingly, it is the petite bourgeoise style of management in a small and comparatively inconsequential firm that hits Sandra square in the face. The brusque owner of the firm is more amenable to letting her stay than the horrid factory foreman. Why Sandra would want to remain working with colleagues who are at best two-faced at worse physically violent is a psychological nuance related to her desire for company (any company) to keep her spirits up. That the business in question lies within the renewable energy sector, stereotypically ‘fuzzy’ and ‘right on’, but still stoops to such vindictive internecine strife, adds an extra layer of irony. The Dardenne brothers specialise in such dramas (Kid On a Bike, 2011) and present a variety of responses from Sandra’s colleagues to challenge her, from them openly weeping at their treachery, to beating her up, to flatly refusing to talk with her at all, they represent all manner of people and human reactions. But this interesting set-up is, for me at least, what undoes the film. Sandra, moral girl that she is, makes it clear from the outset that she will speak to everyone in more or less the same way to avoid unduly influencing their decisions and to avoid having a pity vote. But this results in you hearing what amounts to the same conversation over and over. This is a brief film (only n hour and a half) but feels longer due to the repetitive nature of the dialogue.